What If Gas Cost $100 a Gallon? The Oil Drum How Will Local Governments Respond to Large Increases in Energy Bills? ASPO Switzerland was founded 1.5 years ago by Daniele Ganser, a young professor of contemporary history at the University of Basel. His primary research interests concern the politics of peace, and it was in this context that he began to study the political and sociological implications of Peak Oil: How can humanity transition from a paradigm of continuous expansion and exponential growth to one of sustainable development and stagnation while avoiding violent resource wars as they are likely to erupt over control of the last remaining oil fields? Prof. Ganser managed to assemble a competent team of ASPO enthusiasts including Basil Gelpke, the executive producer of the 2006 movie A Crude Awakening: The Oil Crash, two retired oil geologists, a chemist, and a lawyer to serve on the board of ASPO Switzerland. Last Saturday, ASPO Switzerland held its first general assembly in the Aula of the University of Basel, the oldest of our Swiss universities, established in the 15th century. Although the Aula doesn't date back to the founding years of the university, its air conditioning system didn't work, and also the sound system worked only sporadically; but maybe, this was intended to give us all a glimpse of what life after the oil crash may look like. Colin Campbell, the spiritual father of all ASPO organizations, had been invited as the guest of honor, and he sat patiently through the conference, although the official conference language was German, a language that Colin claims not to speak or understand. For this reason, although Colin offered a fascinating, highly authoritative, and very convincing presentation as always, he could not fully participate in the subsequent debate, and in particular, he could not comment on the speeches delivered by other participants. As was to be expected, Colin told us that the peak of conventional Oil is taking place right now. There remains lots of unconventional oil in the ground, but those oil reserves are expensive to produce, and their EROEI is very low. It takes at least as much energy to produce this oil as one can get out of it. Hence he does not believe that unconventional oil, like tar sands for example, will ever play more than a marginal role in meeting our energy needs. He told us that the current high oil prices are caused by supply no longer meeting demand, and that the time of cheap oil is over for good. Colin also mentioned Peak Gas. He told us that gas is different from oil, because it expands on its own. Thus, the percentage of cheaply producible gas is higher than that of cheaply producible oil, and consequently, Peak Gas does not occur when 50% of the gas has been produced, but only, after maybe 75% will have been used up. 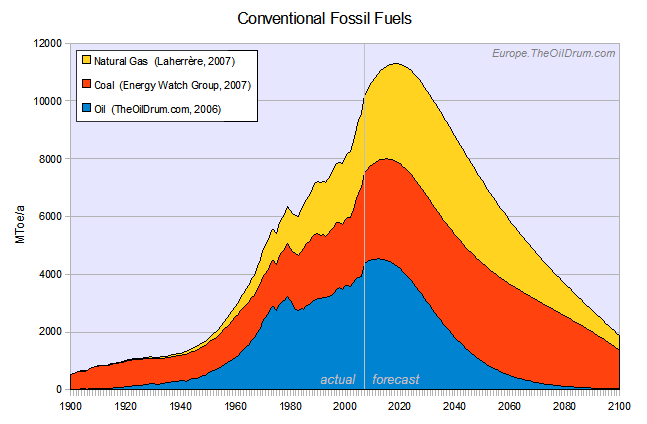 The good news is that Peak Gas will occur a few years later than a Hubbert-type analysis would suggest. The bad news is that, once gas starts declining, it will do so very very fast. It is customary here in Switzerland that all sides of an issue be heard, and consequently, Ganser also invited Dr. Rolf Hartl, the CEO of the Erdöl-Vereinigung (Swiss Association for the Use of Fossil Fuels), to give a talk. Dr. Hartl is immensely influential in Swiss politics. He is a member of the Energy Commission of the Swiss Academy of Engineering Sciences, and since every member of a committee here in Switzerland is essentially given veto powers, he is able to exert enormous influence on the energy policy of Switzerland. The way it works is that one side claims that Peak Oil is taking place right now, whereas the other side claims that it won't occur for another 50 years, and rather than trying to establish the facts, the committee aims to come up with a paper that everyone is willing to sign; and so, official Switzerland issues the "verdict" that Peak Oil will take place 25 years from now. Direct democracy comes at its price, and the price to be paid is often that important decisions get blocked indefinitely. Of particular interest in Hartl's talk was a recent change in his message. Whereas Hartl in the past always claimed that Peak Oil is still many years away, he meanwhile admits that the peak of conventional oil is occurring now. His new story is that the unconventional oil, of which there still is plenty, as everyone agrees, will be able to replace the conventional oil and will facilitate a continued growth of oil exploration and exploitation until at least the year 2030, at which time we might reach a plateau. A decline of oil supply is not to be expected until at least the year 2040. Dr. Walter Ziegler, ASPO board member and retired oil geologist, told us about his experiences with producing conventional oil over half a century. He showed us graphs of oil production of one field after another, each exhibiting a period of growth, followed by a peak, and then followed by a period of perpetual decline, just as Hubbert had predicted. Michael Kaufmann, Associate Director of the Swiss Federal Office of Energy, spoke about the political efforts undertaken at the level of the Swiss Federation concerning the establishment of a meaningful energy policy. ASPO Switzerland, of which I am a proud member, was founded with the intent of raising the awareness of the Swiss public to Peak Oil and its consequences. Has ASPO Switzerland reached its goal? The Aula of the University of Basel holds 400 people, and most seats were occupied. ASPO Switzerland has meanwhile close to 300 members, many of whom attended the event, some bringing family members or friends along. Swiss TV as well as RTL came and interviewed Colin Campbell and Daniele Ganser. Until now, Swiss Radio broadcast a 3.5 minute interview with Colin Campbell, and three Swiss newspapers, the St. Galler Tagblatt, the Berner Zeitung, and the Basler Zeitung, printed reports about the event. Yet, how many people pay attention to these reports? When my wife and I were wandering through the old parts of Basel after the conference, asking ourselves, how many of the people we saw going about their daily business have an inkling of Peak Oil and what it means for them, we came to the conclusion that Switzerland by and large is still behaving like Sleeping Beauty before the prince came to rescue her. Switzerland is at the tail end of European countries with respect to fuel efficiency in private vehicles. Whereas 10 years ago, the average private car in Switzerland weighed 1300 kg, the average weight of private cars has meanwhile risen to 1500 kg. Whereas the minergy standard was developed here in Switzerland in the 1990s, even today, only 20% of the new houses are built to that standard. Central oil heatings still dominate the heating market here in Switzerland, and even new buildings are still frequently equipped with oil burners. The economy continues to be going strong, and the warning signs of the looming oil crash aren't on the wall yet. For Mr. and Mrs. Swiss, Peak Oil has not turned into an issue as of now. They are more surprised than alarmed about the suddenly rising prices at the gas stations, and they have not modified their driving habits yet because of them. Maybe at least as interesting as asking who attended the conference and reporting about the speeches that were delivered may be the questions of who did not show up, and which topics were not mentioned. As far as I can tell, not a single one of my 40 colleagues of the Energy Science Center here at ETH Zurich was in attendance. I might have overlooked one or the other, but at least, I did not notice a single one of them. Are they all simply too busy, or is the study of Peak Oil of no concern to them? A good case was made establishing Peak Oil as a reality, as a historical fact. One speaker after another came forward to present data and arguments establishing the reality of Peak Oil. Even Hartl had to admit that "Peak Conventional Oil" is taking place right now, and since unconventional oil isn't ready "yet" to replace it, we may see a few years of oil shortage. However, with all this talk about when Peak Oil is going to occur, there was hardly any time to talk about its consequences. 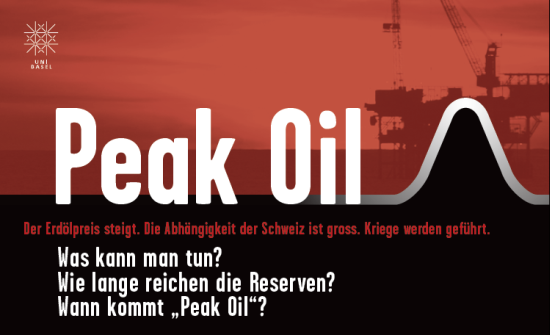 What does Peak Oil mean for Switzerland? Colin Campbell mentioned briefly that, after Peak Oil, the oil producing nations will keep more of the remaining oil for themselves, i.e., oil export will dwindle faster than oil production. Switzerland, as a country poor in natural resources and big guns, may suddenly find itself at the end of the feeding line. Yet, I doubt that this message came across. It was mentioned once in a fleeting remark that one of the consequences of Peak Oil and its accompanying high fuel prices will be a shift of wealth from the consumer to the producer nations. Hence Switzerland may find itself in a considerably weakened position economically after Peak Oil. It was never mentioned that agriculture is an engine for turning oil into food. Peak Oil means Peak Food. What does this mean for Switzerland? How is Switzerland going to feed its population of 7.5 million people after Peak Oil? How will Switzerland defend its position in the world? What, if anything, can we do to improve our situation? Unfortunately, there are no very good answers. The problem is simply too big. There will hardly be a happy ending. Princes only show up in fairy tales. Thanks for the writeup. Very interesting. I thought things were a bit further along in general understanding in Switzerland. Did you cover the series of consecutive multiple peaks issue beyond peak 'easy oil'? 1. Peak light sweet crude (as of now)? Maybe not in that exact chronological order. It seems the discussion has already moved along into that direction (RE: Chris Skrebowski interview on BBC, May 22nd). SamuM - this is a smart way of breaking down the problem. Declining light sweet production will likely control the rest. Thanks for the comment. The answer is no. Peak discoveries (sometimes in the mid 1960s) was mentioned by several speakers, and various people talked about the distinction between conventional and unconventional oil, but no further distinctions were made. I was also there and was a bit disappointed that not more time was spent on discussing the implications for Switzerland. - What are your thoughts on the food issues for Switzerland? - How much do we actually import? - How many people could Switzerland support in a PO world? Thanks, Chantal, for sharing this discussion with us. I knew that Colin is thinking in these categories. He even mentioned it, albeit in a somewhat cryptic form. He talked about the agricultural revolution. It was mentioned that, before agricultural machines (all running on Diesel fuel!) became available, humanity was using slaves to work the fields. I don't remember his precise numbers, but he said something like: without the agricultural machines of today, we would now need 200 million slaves to plow our fields. The comment about hostility toward foreigners is also very appropriate. We see this already now in South Africa (on the news within the last week or two). Switzerland is by no means immune to this. The Swiss Peoples Party (SVP) has as many followers in Switzerland because of their restrictive immigration politics. Many people say openly that they deplore the rise in crime rate here in Switzerland, and they blame the high percentage of foreigners for it. Food is, until now, not an issue, but it could very well turn into an issue in the future. Your question is a difficult one. What we know for a fact is that, during WW-II, a population of 4 million people (little more than half of the current population) survived barely on a diet of 1800 calories per day (Wahlen's potato war). At that time, Switzerland had almost twice the arable land available that it has now (more of the land has been paved over in the meantime), and we had 14% farmers, whereas we currently only have 2% farmers. Of course, the green revolution of the 1960s (nitrate fertilizers) has increased the yield of the land dramatically, but it takes lots of energy (though not necessarily fossil fuel) to produce the fertilizers. Statistically, Switzerland doesn't have the highest population density in Europe, but practically it does. The reason is that only about 1/3 of the country is arable land. A second third are steep slopes at high altitudes that can only be used for grazing but not for planting. The final third is ice and snow. I doubt very much that 7.5 million people can survive in Switzerland without massive food imports. Currently this is not realistic of course, and most people won't respond until there is a true crisis anyway, but at least it is good to know that in theory we could (barely) survive :-). What do you suggest people do who live in Switzerland to prepare for PO (besides starting to plant a garden... :-). I would suggest you investigate "Aquaponics" and start stocking Lake Geneva! It depends on your circumstances. Switzerland is a peoples of renters. The majority of the Swiss live in rented apartments rather than in private homes. Such people can do relatively little ... not even plant a garden, except possibly on their balconies. If you are lucky (wealthy) enough to be a homeowner, you can do much more. You can try to minimize your exposure to fossil fuels. Primarily, you may consider throwing your central oil heating system out and replacing it by a heat pump. You might consider going for a liquid-to-liquid heat pump that can be supported on the primary side by a geothermal system. You might also consider to support the system on the secondary side by solar collectors. The viaGialla website may help you figure out what you might need at the location where you are. If you have an older car that you wish to trade anyway, you might consider getting a smaller (lighter) car that offers a better gas mileage. I wouldn't recommend to switch cars just for that purpose, because already in a year or two, you might be able to get a yet better deal, but if you are thinking about trading cars anyway, fuel efficiency should be taken into consideration. The worst electricity consumers in any household are refrigerators and freezers. Most modern appliances here in Switzerland are optimized for low electricity consumption, but if you currently have a very old refrigerator and/or freezer in your home, you might consider trading it. The reduction in your electricity bill will pay for it after a reasonable amount of time. These are items that often are worthwhile looking into, beside from low-energy light bulbs that everyone is talking about. Anything else (like replacing windows or improving insulation) needs to be analyzed carefully and requires an expert. I wouldn't do it, unless you plan to renovate your home anyway for other reasons. When energy rationing starts, people will have to do a lot more. However, the savings that you propose hurt, i.e., people won't agree to do those things, unless and until they absolutely have to. I only propose savings that I would consider myself, i.e., things that make sense here and now, either economically, because they pay for themselves within a reasonable time frame, or because they increase my independence, i.e., raise my level of preparedness for the harder times to come. Yeah, my comment was flippant but these are also things I have considered for myself. Different people are prepared to do different things. Keep in mind it's not a choice for everyone either. It would be swell if those who have choices made them so as to make it easier for those who don't but that's not likely to happen any time soon, is it? I would welcome rationing actually. What I'm concerned about is the over-privileged pricing out everybody else. It is railroads and not oil which enabled Switzerland to import so much food. The country imported food before the combustion engine became a factor and I don't see why it should stop importing food because of a decline in oil production. If Switzerland had to feed itself for some reason, people would of course have to emigrate (as they used to do back in the day). Racist pogroms (how do you tell a foreigner from a citizen?) wouldn't be sufficient considering the likely magnitude of that shortfall. But how useful is it base one's reasoning on national boundaries really, especially in the heart of Europe? Of course ... as long as the food exporting nations still are able to produce a surplus that they are willing to sell. Food shortage will not become a problem immediately here in Switzerland, because there is more elasticity in food production than in energy production. When the times get harder and people have less money, they'll reduce their consumption of meat and turn to eating more of the cheaper food items, like potatoes and bread. As the demand for meat shrinks, the sizes of the herds will get reduced, and more vegetables will be produced instead, thereby increasing the ability to feed more people. I hope it will never come to racist pogroms, but people aren't rational. Whereas each individual person is open to logic arguments, masses rarely are. In times of hardship, it is natural for humans to turn around and look for a culprit to blame. The Swiss are no better than other people in terms of xenophobic tendencies. It may be neither "useful" nor "rational," but in times of hardship, people remember their roots. National identities become stronger, not weaker in such situations. This may have negative consequences (like in the case of racist pogroms), but it is not purely negative. It gets neighbors to band together and help each other out. as long as the food exporting nations still are able to produce a surplus that they are willing to sell. Capitalism can create a surplus at arbitrary production levels by starving the locals and history is replete with cases of famine-striken countries exporting food. In any case, we seem to agree on the bottom line: that the viability of Switzerland as we know it is being decided abroad. There has indeed been a relationship between the size of the herds and the availability of cheap grain for import in the past. The way I see it, it's more of a supply story than a demand story though. It's only one of the things that could happen. I noticed some comparisons with WWII in this thread and they're somewhat valid but look at what happened in WWI with the general strike! There's no such thing as a nation of neighbors. In any case, what we face is an economic problem. Whatever people end up identifying with, these feeling are not convertible into wheat bushels... international trade is what's going to make these bushels happen. Der Ölpreis liegt bei über 130 Dollar pro Barrel. Doch wie weiter, wenn die Ölvorräte langsam zur Neige gehen? In Basel haben Fachleute über diese Frage diskutiert. Yep. Don't rock the boat. The first of the speakers to be shown on TV was Dr. Hartl, who explained to the Swiss public that oil production will continue to grow for quite a while. Then, they showed Prof. Ganser, who said in the excerpt shown that, when Peak Oil comes e.g. in 2015, it is better if we are prepared for it. Finally, they showed Dr. Campbell who philosophized in the excerpt shown about the physical nature of oil fields: they all mature and then start producing less and less oil. The story ended with the observation of the commentator that all of the scientists agree that there is still enough oil for several decades to come, but ultimately, the flow of black gold will end. Francois - thanks for this enlightening report from The Alps. How much primary energy does Switzerland produce from Hydro and is there room to expand this? I have a couple of questions / points to make. In his recent post on the ERoEI of Tar Sands, Professor Hall presented data showing that the ERoEI may be around 5. Now I know this is still low but it is a lot higher than unity as mentioned in your report. I appreciate that you are reporting here what Colin Campbell said at the meeting but would you care to comment on where you think the ERoEI for producing the tar sands lies and does it really matter if the figure is 1 or 5? Peak Oil means Peak Food. I have reached the provisional conclusion that humans will ultimately prove to be smarter than yeast and that energy resources will be prioritised to the agriculture sector and since agriculture uses less than 10% of our primary energy that we will continue to produce sufficient food for our own needs for decades to come - but perhaps not enough to feed the world. Would you care to comment on the socio-economic and political consequences of this for Europe. How much primary energy does Switzerland produce from Hydro and is there room to expand this? According to the official statistics provided, Switzerland is currently producing 60% of its electricity from hydroelectric power plants. The other 40% are mostly nuclear. Switzerland itself produces less than 2% of electricity from fossil fuels, and less than 1% of the consumed overall energy is from coal. The statistics are a bit deceiving though, because Switzerland is trading electricity with neighboring countries. At the current time, Switzerland is still exporting slightly more electricity than it is importing. Some of the electricity produced in Switzerland is exported, especially during summer months, whereas some of the electricity consumed is imported, especially during the winter, when our consumption is highest. Some of the imported electricity is produced from fossil fuels, including from coal, and this is not shown in the statistics. Switzerland has increased the amount of electricity produced from hydroelectric power plants over the last few decades by replacing many of its turbines. Modern turbines have a higher efficiency than the older types. The natural sources of water at high altitudes are largely exploited, i.e., it doesn't make economic sense to build many more reservoir lakes. However, this doesn't mean that hydroelectric energy is already at its limits. Switzerland is using many big pumps to pump water uphill into the reservoir lakes during hours of low consumption, to let it flow down again during hours of high consumption. Once a higher percentage of our electricity is being produced using photovoltaics, which has to happen, the daily fluctuations in electricity production will grow. At that time, we'll need more and bigger pumps to balance supply and demand. Believes that there are many opportunities for small hydro left in Switzerland. Run-of-the-River installations require no reservoirs. they have even extracted power from potable water and sewage outfalls ! To get bitumen from a SAGD well requires at least 1 mcf of natural gas, that is about 1/6th of a barrel of oil equivalent. More energy was required in the upgrader in order to produce a light synthetic oil. There was a net gain of energy and the process was profitable. In-situ operations might also be fueled with distillates produced by upgrading bitumen or by gasifying coke produced from upgrading and refining operations. One barrel of oil = 42 gallons. I heard a recorded conference where an oil executive stated an EROEI of 4 for tar sands operations. To get bitumen from a SAGD well requires at least 1 mcf of natural gas, that is about 1/6th of a barrel of oil equivalent. How much bitumen per 1 mcf of natural gas? Do you mean 1 barrel? I appreciate that you are reporting here what Colin Campbell said at the meeting but would you care to comment on where you think the ERoEI for producing the tar sands lies and does it really matter if the figure is 1 or 5? Don't shoot the messenger! I was only reporting what Colin Campbell said during his presentation. I do understand how oil is being produced from tar sands, but I personally have no knowledge about the EROEI of these processes. I have no reason to doubt your figure. However, the calculation of EROEI often depends on which parts of the process you include in the calculation, and which parts you exclude. For example, do you include the amount of energy expended in either transporting the water to where the tar sand is, or alternatively transporting the tar sand to where the water is? Do you include the energy expended in reforesting the strip mines, after you are done with mining? Colin may simply be a bit more thorough in which processes he includes in the calculation of the EROEI, but then again, I have not seen his calculations. I only attended his presentation. I hope you are correct, but I have not seen much evidence of it yet. Individual humans are most certainly smarter than yeast in their personal dealings, but humanity as a species may not be. At least, our reproduction habits are no different from those of lab rats, and although Hubbert started talking about Peak Oil in the mid 1950s, and although we started talking in earnest about the Limits to Growth since the early 1970s, we have done very little if anything as a species to counter the looming problems that we clearly recognize. As long as we let market forces reign supreme, the rich and famous will continue driving their SUVs around, even if this means to take food out of the mouths of the poor, simply because they have deeper pockets and can outbid the poor for the remaining energy resources. ...As long as we let market forces reign supreme, the rich and famous will continue driving their SUVs around, even if this means to take food out of the mouths of the poor, simply because they have deeper pockets and can outbid the poor for the remaining energy resources. "Let" implies "we" are in charge - but it is the "rich and famous" who are in charge. "We" will be the starving poor. He is right. It's "let." There is not a government in the world that can actually stand if its people is united against it. But "the people" allow their fear to stop them. "They" are in power because we allow it. Plain and simple. I don't think it is either plain or simple. Burmah, Zimbabwe, Tibet, Kenya ... The rich and powerful control the media, government and most things in the West. They are not going to unite with the mass of population (which is rarely homogeneous) to change things in favour of the masses. I have no proof of this but I feel, as oil runs down, more and more regimes around the world will become authoritarian and if they can get the support of the army, the general population will be able to do sweet FA. I don't know about Switzerland but in Britain, more and more repressive legislation has been passed in the "War on Terror"
I too hope you're right Euan and whilst technically, seeing as only a small proportion of our fossil fuel supply is employed in agriculture, it should be possible, I am not confident. Today there are a significant number of people going hungry, why is that and how will the current situation improve rather than deteriorate further? The trends going forward are for increased population, reduced area under the plough (due to desertification, urban expansion, ground water depletion etc) and reduced productivity as fossil fuel inputs reduce as prices rise. It would be a monumental shift to install some kind of equitable, global command economy, ensuring some 6, 7, 8bn+ are fed. More likely I suspect is increased food inequality and approximately flat to slowly falling global food productivity over the next few decades. However, I read just yesterday that the 4.5bn cattle, sheep, goats on the planet have a larger biomass than the human population (and subsequently consume a larger proportion of bio-productivity). We could pretty much alleviate all food shortage problems by not eating meat and dramatically cutting down on dairy. Rather than 3bn people dieing, we could choose to reduce the global domestic herd by half thereby freeing up the space in ecosystem. "We could pretty much alleviate all food shortage problems by not eating meat and dramatically cutting down on dairy." Uh-oh, that sounds like a vegan diet, the fuel the human body is perfectly designed to process (I've learned TOD isn't too educated on the truth about animal foods)! The stupendous amount of grain, water, resources, etc. used to feed livestock would certainly seem better off being used directly to feed humans. But then of course the death rate would drop significantly due to decreased chronic diseases like artery disease and cancer, etc. Thus population would continue to increase exponentially. Although I obviously agree with eating low on the food chain is an important solution (permaculture), it still won't solve the underlying problem, which is POPULATION GROWTH. Though overall it would be a big improvement as far as human and planetary health (see the United Nation's 2005 report "Livestock's Long Shadow" - it shows that livestock causes more co2 equivalent emissions than ALL OF THE WORLD'S TRANSPORTATION COMBINED!). Just goes to show, there is indeed no such thing as a meat- or dairy-eating environmentalist! ;) It's insane that driving a hummer can be seen as immoral by the public, yet eating meat and dairy, which is environmentally even more devastating to the planet, is still seen as par for the course, just because people hate hearing the truth about their bad habits! When the truth is the #1 thing people can control that will improve their health and the planet's health is the removal of animal products from the diet. This is robustly supported by the science - but the brainwashing is quite thorough in industrialized countries, since the wastefulness of eating animal products is a status symbol, just like the Hummer! Regardless, the price of animal products will steadily rise until once again it is only the elite who eat large amounts of animal foods and suffer the inevitable consequences - of course the enormous government handouts given to livestock producers keeps prices artificially low anyway. For example cattlemen can use (destroy really) public land and pay pennies on the dollar. Ha, well it doesn't sound too good when you put it like that. So the opportunity cost of (b) is 4bn people whereas the cost of (a) is dietary change. Which is the better choice? Reducing the cattle count to allow the human count to be maintained doesn't need to have any additional negative impacts on biodiversity. I don't think you're suggesting there is some biodiversity advantage in having 4.5bn such animals rather than 1bn are you? That we must even ask this question shows how little we deviate in behavior from lab rats or yeast. In the short run, (a) is better ... especially for those who otherwise belong to the 4bn surplus ones. In the longer run, (b) is better, if we can accomplish this by natural attrition. ... It's easy, once our species learns, not to breed like lab rats. Farmland values are increasing in the double digits. Prices for commodities such as corn and cotton are up an average of 41 percent over last year, driven by global demand. And farm household income is averaging more than $89,000 annually. But for Lloyd Arthur, who grows cotton in Crosby County northeast of Lubbock, there's just not much cause for celebration. Mr. Arthur has seen his diesel, fertilizer and herbicide costs skyrocket right along with commodity prices in the last year. In the UK the bbc radio program "farming today" reported the same information last week and said farm incomes will fall when the current input costs hit. have you studied the Malawi experience in food production 2005-2007? Sure, it was achieved through a combination of heavily subsidised fossil fuel based fertilizers and a record rain fall, but it does make one pause and think. If significant increase in sustainability and food production in all rural African countries was possible, would it lessen the impact of peak oil on food scarcity (assuming available fertilizers and global warming not screwing up the weather)? Just give us your guess. None of us has the real answer. I have not followed the Malawi story. Hence I cannot comment on it. There are two separate food issues that must not be confused with one another. Since lots of Diesel fuel is being consumed in the production of food (to run the tractors and the pumps for irrigation), the price of food is invariably coupled to the price of fuel. As the demand for oil surpasses its supply, the price of fuel invariably rises, and consequently, the price of food rises with it. This does not affect us very much here in Switzerland and in other rich countries, but it affects the campesinos of Mexico who can no longer afford their tortillas and beans. The poorest of the poor are being squeezed not only out of the fuel market, but even out of the food market. This is not a future problem. It happens right now. Market forces won't fix that problem. Without government subsidies, millions of poor people everywhere in the world will die of hunger in the coming years. This must be acknowledged, and it must be prevented. The above problem happens irrespective of the amount of food that is being produced. Argentina currently produces five times as much food as the country needs to feed its population of 30 million people, and yet, there is hunger in the slums of Buenos Aires. Some people don't get to eat, not because the food is unavailable, but because it is unaffordable. The second problem is one of availability. As the oil becomes scarce, less food will be produced. We currently live beyond our means, and we won't be able to continue do that indefinitely. Eventually, we'll need to learn to live in a sustainable fashion. At that time, the more humans there are, the less food per capita there will be available. Hence we have a choice to make. Either we learn to exert effective population control and reduce our numbers (hopefully by natural attrition!) so that those alive can live more comfortably, or many of us will live very poorly. Of course, we can (as was suggested) reduce the sizes of our herds and live on a more vegetarian diet. In this way, we could provide food for more people. Yet, this may be unrealistic, unless we totally abandon the principles of free market economy. As long as food items are still obtainable for money, the rich will continue to eat steak daily and have their avocado salad flown in in January ... and we all hope that, when it comes to it, we belong to those rich and famous who can afford to continue wasting energy left and right. As a relatively recent immigrant to Switzerland it isn't obvious to me that the situation is as bad as presented here. Having come from Canada I'm in very little doubt that Switzerland is in a better position to cope with peak oil than most parts of Canada... (Alberta excepted). For a start Switzerland is fairly self sufficient in electrical production (figures I read vary slightly but something like 50-60% is Hydro and nearly all the remainder nuclear). The transport network is fantastic and unlike many other European countries many of the smaller less used train lines have not been shut down so a large fraction of settlements still have train connections. The train network is virtually 100% electric. As to food production vs. population, is it really any worse off than other European countries? A quick glance at wikipedia gives 181, 230, 246 people/km^2 for Switzerland, Germany and the UK, respectively. The type of farming here strikes me as much more sustainable than elsewhere as it is often much smaller scale with far less mechanical intervention than elsewhere (eg. cows walk up to pastures in the summer (no trucking) and lots of the hay cutting/gathering is done by hand or with smaller machinery which presumably is less energy intensive). Ofcourse it depends on your view of how peak oil is going to play out as to how well the Swiss economy (based on high tech manufacturing, banking and tourism) is likely to do but it seems to me that in the past it has been fairly robust to recessions compared to other countries. As a relatively recent immigrant to Switzerland it isn't obvious to me that the situation is as bad as presented here. Having come from Canada I'm in very little doubt that Switzerland is in a better position to cope with peak oil than most parts of Canada... (Alberta excepted). For a start Switzerland is fairly self sufficient in electrical production (figures I read vary slightly but something like 50-60% is Hydro and nearly all the remainder nuclear). This is true. However, the Swiss government predicts a deficit of electricity starting around 2012. As oil becomes more expensive, more people will throw out their oil heating systems and replace them by heat pumps, which consume electricity. It can also be expected that finally, electric vehicles and/or plug-in hybrids will conquer a significant portion of the private transportation market. These vehicles consume electricity. The Swiss are currently fairly wealthy, and they have always been good at embracing new technologies. For example, flat-screen TV sets have invaded Swiss living (and bed-) rooms faster than those of other European nations. Hence we can expect that the demand for electricity will grow quite a bit over the coming years, and there are currently no new power plants in the making to fill that growing demand. The transport network is fantastic and unlike many other European countries many of the smaller less used train lines have not been shut down so a large fraction of settlements still have train connections. The train network is virtually 100% electric. This is true also. In fact, it is a Federal mandate that all communities can be reached by public transport. The smaller mountain villages are all reachable by our yellow postal buses. I also think that this is a big plus. I explained this elsewhere in this thread. The population density is deceiving because of the large percentage of land area that cannot be cultivated due to high altitude. It is true that the Swiss farms are on average much smaller than in many other countries, which will be a plus after the oil crash. Moving the cows to the mountains during the summer months is a tradition here in Switzerland that is dictated by the local topology. The Alpine meadows cannot be used for anything but grazing, and by moving the cows away from the lower pastures during the summer, the farmers can cut some grass and store it to feed the cows during the winter months. Switzerland has three levels of agriculture. The low lands (below 700 m.a.s.) are used primarily for plantations. The medium lands (between 700 m.a.s. and 1000 m.a.s.) are used for milk farming, whereby only some of the cows stay at these altitudes during the summer. All of the young animals and some of the cows are sent to the mountains for grazing between May and September. The high lands (above 1000 m.a.s.) are Alpine meadows that are only used during the summer months. Manual labor is minimized, just like everywhere else. Hay may be cut by hand, but only on slopes that are so steep that the agricultural machines cannot negotiate them. Farms are small, but farmers help each other out, i.e., most farmers don't own all of the agricultural machines themselves, but borrow them from a neighbor during the time of harvest. I think, they have done a fair job so far. The scale and effect of the conference was very much better compared to last year. In his entry speech, Ganser presented about a dozen representatives in the Swiss federal parliament whom he has, in the meantime, won as ASPO members. One of them, Geri Müller, has placed, in March 2008, an appeal to the federal government to form a federal commission of experts who should define preparatory steps against the consequences of peak oil. (In Saturday's discussion, Dr. Hartl predicted that such a commission will not be agreed on). Strange enough, the ASPO assembly voted in favor of a new appeal to the confederation to form a 'council of sages' (Rat der Weisen) to deal with peak oil. The discussion made me feel there are quite a number of university personnel already aware of peak oil and fed up with the non-response of the authorities. Peak Gas will occur a few years later than a Hubbert-type analysis would suggest. The bad news is that, once gas starts declining, it will do so very very fast. If you add up a lot of similar distributions of any shape, you get a gaussian. I assumed that is why peak oil has that shape, and would be the same for peak gas, even if the shape for a particular well or field is quite different. I'd love to hear an expert comment on this. The Oil Drum for Oil. Click for large version. This is true if you draw from independent samples. The samples are, of course, not independent here, because the larger gas reserves are found earlier than the smaller ones, just like in the case of the oil, but I doubt that this influences the distribution of the sum very much. I am inclined to believe that you are correct, i.e., that the distribution of the sum is still essentially Gaussian. If you add up a lot of similar distributions of any shape, you get a gaussian. I assumed that is why peak oil has that shape, and would be the same for peak gas, even if the shape for a particular well or field is quite different. The solution to the logistic equation has a shape similar to a gaussian. But I don't think they have much to do with each other. Folks will say that the use of the logistic to model petroleum production is rather arbitrary, that the logistic just happens to fit. That is an overly weak analysis in my view, though probably appropriate in circumstances where the audience doesn't want to think very much! If one adds up a lot of distributions of arbitrary shape, one can actually generate just about any shape at all. It all depends on the distribution of the distributions! If there were scads of little oil fields all over the planet, and each oil field had a roughly bell-shaped production curve - and if people started producing the oil from the different wells at random times over the course of several millennia or so, then the global production curve would be quite flat over those several millennia. So a very interesting question is: why is the peak in the USA lower 48 so closely correlated in time with the peak in the Middle East? Maybe they'll be 50 years apart, but on the scale of human history, that's quite tight. It seems quite clear that the reason is that technology moves easily around the world, both production technology and consumption technology. Well, and the oil itself gets shipped around the world. Once the USA production gets ramped up, then everyone realizes the value of the oil and also how to get it. (I realize that my history is too simple here - Caspian oil was also produced long ago, and probably elsewhere too - my point is merely that production and consumption is a global affair). If you add up a lot of similar distributions of any shape, you get a gaussian. It will help to be more clear about what this "adding up" consists of. A Gaussian is a probability distribution P(x). It describes the probability that some random variable will have a particular value. Suppose the x is actually the sum of a bunch of components, each with their own individual probability distribution. Suppose also that when we select an x out of our population, what we are actually doing is selecting each component of x out of its own population - and that each of those component selections is uncorrelated with the others - and we add up all the ocmponents to get our final sum x. This is the kind of "adding up" that will generate a Gaussian, with a few other assumptions. E.g. if each component of x has the same distribution, of any arbitrary shape, then as the number of components increases, the distribution of the sum x will look more and more Gaussian. Now let us look at what we are doing with bell shaped petroleum production curves. Production is a function of time. Is time a random variable that we pick again and again out of some population? Even more to the point - is our selection of time actually a selection of many component times that then get added up to form a total time? Note that adding up times is quite meaningless without the further assumption of some origin of time. So the "adding up" that gives a Gaussian is a very different sort of adding than what happens when one adds the production curves from many little oil fields to give some regional or global production curve! They are entirely different mathematical operations! And the meaning is entirely different, too! Of course, they are positively correlated. It's even worse than that. More energy allowed us to produce more goods, consuming more materials in the process. We also produced more and better food, and therefore, more of us survived. These additional people produced more and consumed more, and as a consequence you get Peak Everything, all squeezed together into a period of one or two generations. Not necessarily. If food prices are allowed to rise in correspondence with oil prices, there will be adequate funds for farmers to bid for oil. Oil conservation in more discretionary areas can allow continued and even increased production of food. For example, airlines are experiencing difficulties coping with higher fuel prices while currently there are adequate margins in farming to pay for oil. If biofuels are allowed to proceed, some biofuel production can be used to increase food production. Biofuel will support food prices which should enable farmers to outbid other uses for the remaining oil for awhile. Less essential oil uses will have to decline. Only high food and oil prices can force this change since what is a essential or not must be determined by the market. I am not active in either one being native English speaking American born but should start as going local is important. I have noticed no meetings anounced by ASPO Germany yet announced on their web site but lots of good articles. They were founded in 2006. The PO Forum has lots of English language news and some translations for German speakers. Switzerland is fortunate in having plenty of hydro electricity. During the second world war it had a petrol shortage and a coal shortage, but human inventiveness is a wonderful thing. If they could come up with a retrofit electric steam locomotive, there is yet hope for the rest of us. "It was never mentioned that agriculture is an engine for turning oil into food. Peak Oil means Peak Food. What does this mean for Switzerland? How is Switzerland going to feed its population of 7.5 million people after Peak Oil?" That will be a problem, but a minor one. Compared to the developing countries. Already there has been food riots in some countries. Monsanto and other agri companies are forcing farmers in the third world into their artificial methods using fertilizers and geno-manipulated seeds. This is like begging for a hunger disaster in the future. In Sweden I am glad to say. That awareness of peak oil is spreading fast the last couple of months.